Muslims across the globe are observing a month-long fast, the holy period, which is known as Ramzan that started on 17th May, 2018. This will be followed by grand celebrations of Eid-Al-Fitr or 'Meethi Eid'. This festival is known as 'Meethi Eid', as people look forward to new beginnings with positivity and blessings of the almighty. People celebrate 'Meethi Eid' by preparing one of the most loved desserts- sevaiyan. According to Chef Osama Jalali from Noida, a lot of hard work goes into making sevaiyan. Usually people prefer cooking it overnight to get the best taste of this delight. There are two types of sevaiyan that are prepared- one is ksheer and the other is kimami sevaiyan. Ksheer is mostly milky, whereas kimami sevaiyan is the dry sevai cooked in sugar syrup. Nowadays, people like experimenting and love preparing newer versions of sevaiyan in order to break the monotony. Let us take you through some amazing sevaiyan recipes that you'd love to prepare during Ramzan and Eid this year. An Eid special sevaiyan pudding, sheer khurma is made with sevaiyan, dates and milk along with coconut, cardamom, khus and almonds. Sheer stands for 'Persian' and khurma is another word for 'dates or khajur'. This recipe is bound to make your Ramzan and Eid special. Sevaiyan roasted in ghee, simmered in honey and sugar syrup along with a mild flavour of nutmeg is all you need to impress your guests this Eid. A quick recipe to prepare, Kiwaamee sevaiyan is just perfect to break your fast during iftar. Adding a twist to the usual sevaiyan by adding gulkand and sugar to make festivities even sweeter, this recipe is bound to make you fall in love with the dessert. Do not forget to add the quintessential rose essence in your sevaiyan. An amazingly twisted sevaiyan dish with vanilla essence, sugar, cardamom, raisins and almonds; this parsi sev recipe will welcome festivities with style. Make sure you serve it hot. Sevaiyan cooked in butter, spices and sugar served with peach murabba; sounds like an exotic dessert? Well, wait till you taste it. We are sure you wouldn't regret a bit. It is loaded with double cream, pine nuts, cloves and jaggery. Mouth-watering much? Make a slightly healthy sevaiyan by adding quinoa and orange to it. Don't forget to serve with jaggery nougat and nuts to make it exceptionally special for festivities to come. It is the best of two worlds and how! 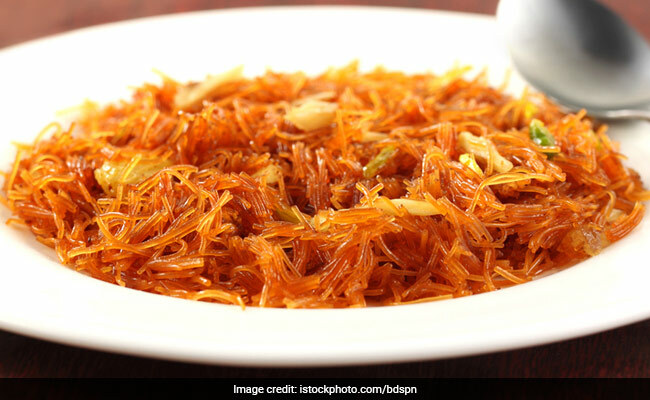 A delicious dish of roasted sevaiyan tossed with sugar, milk and khoya, this dish is a dessert-lover's dream come true. These amazing sevaiyan recipes will surely make Ramzan and Eid super-special this year!